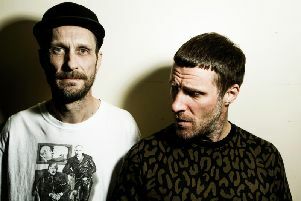 Pop duo Go West are riding the crest of an 80s revival wave and will be joining other acts from the era at the Ricoh Arena later this year. Lead vocalist Peter Cox and supporting vocalist, guitarist and keyboard player Richard Drummie are playing at the StepBack 80s concert at the Coventry venue’s Ericsson Indoor Arena. An extra 1,500 tickets have recently been put on sale to meet demand, which will see acts such as Go West, Tony Hadley, Jason Donovan, Kim Wilde, Nik Kershaw, Paul Young, Cutting Crew and T’Pau taking to the stage. Go West won the best newcomer Brit in 1985 and went on to achieve a string of international top 10 hits including King of Wishful Thinking from the Pretty Woman soundtrack, We Close Our Eyes, Faithful, Don't Look Down and Call Me. Richard says the public’s love for 80s anthems has continued to gather momentum around the world, so much so that they are returning to Australia for another in a series of tours there, this time with Paul Young, Cutting Crew, Wang Chung and Taylor Dane straight after the Coventry performance. He said: “All of the acts get on with each other but there is always an element of friendly competition so we'll all be hitting the ground running. “We like to give the audience the hits. It's an 80's jukebox but with a few surprises thrown in! “It's amazing that we've been doing this for over 30 years thanks to the crowds that keep coming out to see us. We’ve never been busier and have dates booked in for 2019 already. “The 1980s seems to have a fun vibe attached to it where many people enjoy coming to the gigs in fancy dress. As Go West take to the stage, Richard revealed it will be somewhat of a homecoming for one half of the band. The StepBack 80s concert is being promoted by Coventry-based Showtime Promotions, with extra tickets released for the star-studded line up. Dan Nelmes, director at Showtime Promotions, said: “We’ve been overwhelmed by the take up so far, and with a limited number of tickets left we’d urge people to get theirs while they can. StepBack 80s is on Saturday, October 14. Tickets cost £50 plus a booking fees and are available via www.eticketing.co.uk/ricoharena and in person at the Ricoh Arena box office.